How slow would my game be if I split the world up into tons of pieces (over 20 I'd guess) and set up global illumination on all of them separately in separate CCBs, and then just merge them? I know static meshes take more memory than animated ones, so how would CC cope with many static meshes? For me it's the opposite problem :) With just my static meshes (full level + lightmaps for each texture) I get clean 60 fps. When I add more than two or three animated characters at the same time (visible in the level at the same time), the fps instantly goes down to 40 or worse :) ...for WebGL builds, in D3D/OpenGL builds the situation is much, much better. As for lights & lightmapping, if you don't need to have some specific lighting concept for your levels or you just don't have time to mess around with lights, you could try Blender and, instead of lights, just use Ambient Occlusion. It will take you about 10 min to import model, create second UVs & do AO. I just am torn on what to do at this point. See, I'd like to get great lighting in my project, but the limitations this engine has in terms of visuals is holding me back by a lot and is stopping me from making this project a reality... That and the rather simple and non-complex AI system it has. The visuals this engine has are 100% ideal for my project as my game is trying to capture the PlayStation 2-era in regards to the way it looks, but the lighting and somewhat lackluster shadow support is almost a deal-breaker. See, as far as I can tell, if I took an insane amount of time with the built-in lightmapper's global illumination feature, then I could get some very pretty results, but it would take so long and I'd have to split the level into many pieces due to the large nature of them! I'm making a small Web/Apk games with a Desktop builds as not-so-important choice, that's why this engine is o.k. for my thing. It's very fast to build a game & it's light on cpu so it will work on all computers. What I would suggest is that you look at what your goal is. If you can't create your game quickly with this engine, if your target platform is Desktop & if you are planning to have more advanced enemy AI, I think you should maybe experiment with other engines too. Also it may not be a bad idea to have all your assets always cross-engine compatible. You never know what will happen or if you would be forced to switch engines. If your models have lightmaps, they should be in universal formats like FBX/B3D. That's why Blender is a good idea in my opinion. I had the same lightmapped geometry successfully imported in Unity, Unreal, Sketchfab, CopperCube, ClaraIO & even Construct 2 (through 3D plugin). I'm not saying CopperCube lightmapping system is bad, I've tried it & it's very practical. I'm just saying that it's always good to have options. If you are investing a lot of time into modeling & lighting, it's a good idea to be able to use that models & lighting in all available software, not just in CopperCube. Funny that you mentioned the idea of having corss-engine assets: I'm actually in the process of converting the animated meshes and such to FBX files so I can "shop around" whilst using CC. 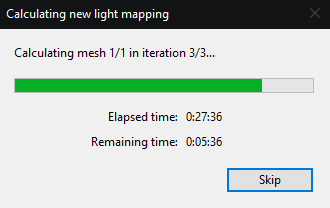 I'd love to see improvements for the time it takes to do global illumination on maps... It takes a very long time... Could any improvements be made, Niko? A possible solution would be to export all static scene elements and their UV as one scene to Blender, calculate the static global illumination in Blender and import back into Coppercube. I thought about exporting the level geometry without the decorative and non-interactable objects (chairs, tables, etc...) and then I can calculate the GI much quicker due to the reduced geometry :) Then just import the objects as a single mesh and set it to dynamic.